As a fan of leadership books, I try to read everything that comes out in this field. Unfortunately, reading hundreds of books on the same topic means there is seldom something really new—fresh, exciting, revolutionary that uplifts the entire genre. The last such surprise for me came several years ago in the writings of Steve Farber. 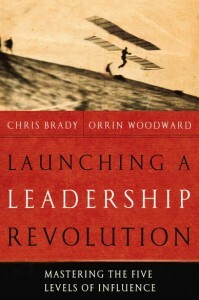 But now, finally, comes another great addition to the leadership genre: Launching a Leadership Revolution by Chris Brady and Orrin Woodward. Their subtitle, “Mastering the Five Levels of Influence,” sounds like typical management book fare, but it isn’t. Each level is vital, well-taught and interesting, and together they form a truly revolutionary model for leadership. This is not exaggeration—this book is excellent! I rank it right along with the best of Drucker, Bennis, Blanchard, Gerber, Collins, Deming, and Farber. It is destined to be a classic. Brady and Woodward teach that everyone will be called upon for leadership at some point in their life. This follows Greenleaf’s tradition of servant leadership, but with a twist. Launching a Leadership Revolution shines because it gets into the specific work of leadership. It outlines many pages of work leaders must do, and explains which work to focus on most. But the book seldom uses the word “work”, instead preferring the active “working.” Just the list of “working” items for leaders is worth more than the price of the book. Maybe the best thing about this book is the authors’ ability to take traditional, classic leadership basics and give them new, profound definitions. Imagine the leadership revolution that would occur if top executives and government officials really did seek to learn from everyone! This is the best definition of leadership performance I’ve ever read in print. And the book teaches the reader how to do it. Likewise, the advice to develop others as leaders moves beyond all the clichés to become “learn to trust your people.” It includes fitting them to be truly trustworthy. That’s what leadership should be– but seldom is even considered. There are many other examples. This book is a revolution that builds on the best ideas and thinkers of the past by applying them in fresh new ways applicable to the information age. We learn from case studies such as George Washington, Winston Churchill, Benjamin Franklin and many others right along with contemporary needs and challenges. Above all, the book places leadership success squarely on the success of mentoring and gives excellent advice to mentors on how to help people bring out the leadership inside them. Everyone serious about Leadership Education will want to read this book, and apply the principles to our learning and mentoring. In truth, great leadership is simply using great influence for great things, and this book can help each of us do this. In these times of government bailouts and “fixes,” it is important to remember that the American Dream never was a government program. The American Dream was a leadership revolution, where regular people chose leadership and became leaders. This revolution is still needed today, perhaps more than ever before in history. I can’t even begin to describe how much the Tri-Lateral Leadership Ledger outlined in LLR has impacted my life in a positive way. I can’t even keep track of how many copies of the book I have given to friends, family and co-workers. On top of that the fact that the author’s decided to give 100% of their proceeds from this edition of the book to charity is an amazing example of servant leadership in itself. The charity, All Grace Outreach, is a fantastic organization which I’m sure benefits greatly from the hundreds of thousands of copies this book sold. Add to your list of books Fierce Leadership by Susan Scott. After giving the subject of leadership several years of consideration, I have come to realize a difference between leadership position and statesmanship freedom. Where a leader performs first for a student to follow, the statesman makes sure that all can perform equitably. In statesmanship institutions, there is no leader. There is no mentor. There is nobody in first command. Authority rests in the open freedom to step out first to challenge and be challenged. In leadership models authority rests in the position at the head of the conference table or lecture hall. It is even found in the content of the books and texts assigned. In a statesmanship model authority remains in the open body called a forum. In a leadership model it is about the position at the front of the lecture hall. I was listening to a news commentator interview a politician from Egypt and this politician said something interesting. He said, “I care not who is elected. I care only how we elect that person.” In a statesmanship model, it is about the equitable process in elections. I believe that when we focus on leadership, we produce too much elitism into rigid positions with virtually no open medium for free expression to test those positions. A statesman is concerned with the form of government and not its leadership. A leader is more concerned with getting the right people in key positions whereas a statesman is more concerned with the fair process in the selection of key positions. A leader, by definition, is inherently antithetical to freedom because it weakens position, whereas a statesman is willing to die for freedom and give up position. But here comes the great twist, a leader can challenge a statesman when the statesman forgets to wax on freedom and wax off the need to control the conscience of others. This happens when a leader assumes a statesman’s poise and refuses to be challenged or contradicted. This is the political world we live in today. When this happens, it is time to be reeducated by one who has been there and done that. It is time for the presumed statesman to get some boots licked, and the boot licking is usually done by one willing to step out among the crowd first, hence the importance of leadership and a free society that allows anyone to step out and say something. Every great statesman begins as a leader who steps out first among the crowd. And if he or she fails to gravitate toward business, government, religious and social forms that foster more freedom for all to step out and assume responsibility, he or she is no better than a tyrant dressed as a Naked Optimist. All this and more to be published in late 2011. I have had the privilege of working directly with Orrin Woodward over the last couple of years. By applying information from this book it has transformed my organization from a group of followers to a group of leaders charged to go out and make a difference. Orrin has become one of the top educators in leadership because he is out leading in his life everyday. I can not wait for future books from Orrin and Chris. Thank you for everything you do! The charity the proceeds go to is a church Woodard is the founder of..